The pilot program devices collected data from a test car and its surroundings at a rate of 10 times per second, which included such information as speed, braking, wiper status, position and motion of vehicles ahead, intersection and curve details. Then, when appropriate, instructions were communicated to the driver alerting him or her to prepare to brake hard, notice another car in the blind spot or making a lane change, or slow down through a curve, among other things. Note that the devices currently in development only provide warnings – they don’t actually intervene with braking or steering. NHTSA has begun reviewing the pilot program findings and in February announced it will “begin taking steps to enable vehicle-to-vehicle (V2V) communication technology for light vehicles.” The next step is release of a report addressing technical feasibility, privacy and security, and preliminary estimates on costs and safety benefits. Also to come, after the public has been given an opportunity to comment on the research findings, will be NHTSA’s draft of regulations which would require V2V devices in new vehicles – subject, of course, to “Executive Orders and guidance.” According to Plymouth Rock Assurance Company, if the government goes forward with a V2V mandate, we could see cars equipped with this technology coming off the production line as early as 2019. 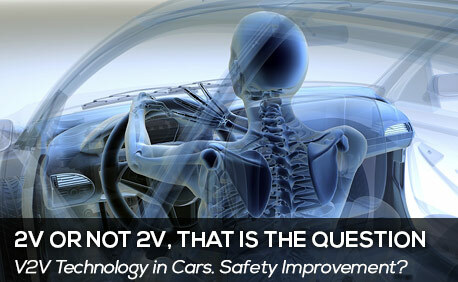 Insurance companies like Plymouth Rock are likely looking forward to having V2V cars on the road. NHTSA estimates that this technology has the potential to help drivers avoid or mitigate 70 to 80 percent of crashes “involving unimpaired drivers.” They’re evidently acknowledging that a driver who is impaired by drugs or alcohol is not going to be alert enough to quickly respond to his car’s warnings. Another caveat is that in order to have a widespread effect, there are going to have to be lots of cars on the road that are equipped with V2V so they can talk to each other. Older models can be retrofitted, but it will still take many years before there are enough high-tech vehicles on the roads that they can have a meaningful conversation.